If you know me at all you KNOW that I LOVE the movie “The Nightmare Before Christmas”. I mean I really, really love it. I actually watch it at least twice a week. I have my tablet set up in the kitchen with speakers and that movie is on while I’m baking and cooking (I switch between that and Alice in Wonderland). It’s my “cooking movie” haha. Speaking of Halloween, it’s almost here!!! Only a few more days! 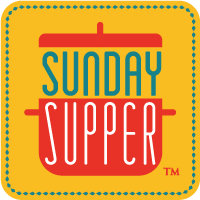 This week’s #SundaySupper theme is Halloween! So I’ve got something special for you! 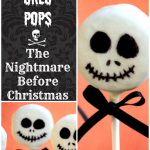 Amazingly super easy, Jack Skellington Oreo Pops!! Jack Skellington, please tell me that you know who Jack Skellington is! If you don’t I just don’t feel like we can be friends…. 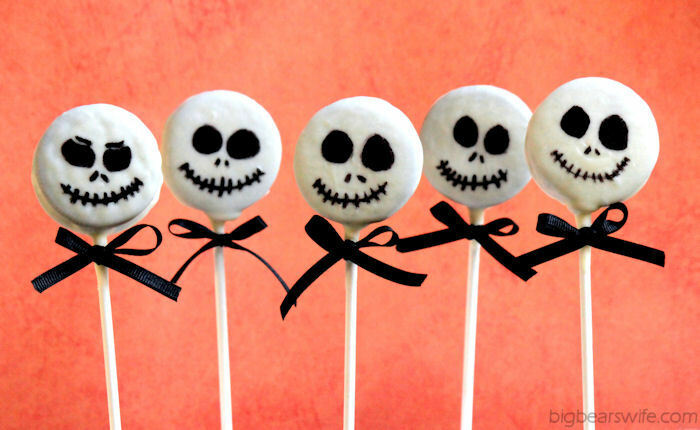 Last year Karyn from Pint Sized Baker made these Jack Skellington Cake Pops and I just loved them! I wanted to make them for our Halloween Party this year and wanted to make a batch for #SundaySupper but since I was being lazy am being super awesome on my Clean Eating Challenge, I thought that having a bunch of cake pops around wasn’t such a good idea. Humm… what else is round? The dang Halloween Oreos that I’ve been eyeing on the top of my refrigerator haha. Those will work! 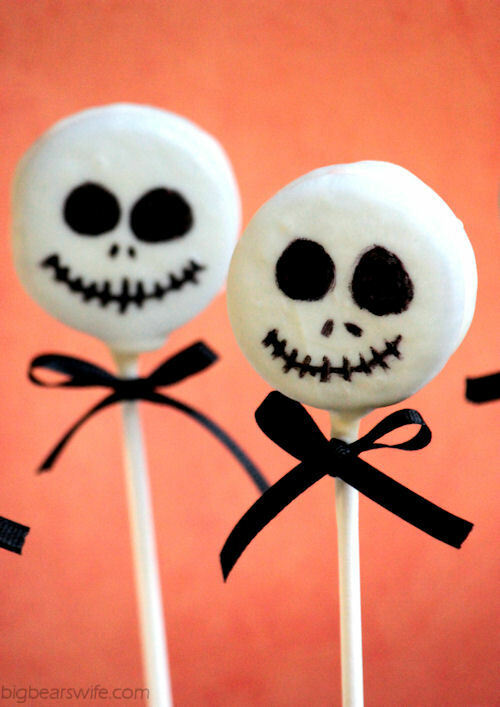 So with inspiration from my favorite movie and Karyn from Pint Sized Baker, I give you Jack Skellington Oreo Pops!! UPDATE! I know a lot of people are having trouble with the Wilton markers, they use to work wonders but the past few packs I’ve bought have been dried out. I recently switched to these AmeriColor Black Edible Markers and I love them! You should be able to find the Americolor pens at Hobby Lobby, Michael’s and maybe even Walmart. Another Tip! My Friend Kayrn made Jack Cake pops and she used Black Cookie Icing for her faces! That might work here too! Melt the candy melts according to package directions. Pour into a short glass. Add a dab of chocolate to the end of the lollipop stick and stick a lollipop stick into the cream filling of each Oreo. Lay Oreo pops onto the foil lined baking sheet. Remove Oreo pops from freezer. Dip the Oreos into the white chocolate one at a time. Covering each one and tapping off the excess chocolate. Place back onto the foil lined baking sheet. Place into the fridge for 5 minutes or until chocolate is hard. Remove Oreo pops from fridge. Tie on Jack's bow to finish the pops. This is super cute, my favorite movie in the hold world, I have tons of stuff from Jack, my secret crush.. is that weird? Thank you for sharing. Beyond cute Angie!!! I have a friend who loves that movie and I have to send her this so she can see it. Awesome. These are so cute. What a fun Halloween treat. Thanks for sharing. What a fab job you did on these pops! 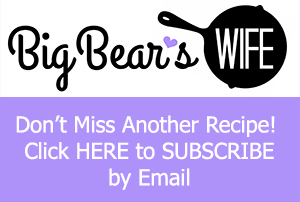 I saw it pop up in my e-mail and I couldn’t wait to read your post!! I just love it!!! So darn cute! These are my kind of treats: easy to make, cute…and Double Stuff Oreos to boot! These are adorable Angie! So impressed with how they look. I love white chocolate dipped Oreos, and these turned out so cute. I also love, that I don’t have to make a cake to make these! Win! These are PERFECT with the Oreos! I love the orange icing peeking out after you take a bite. P.S. I love the Nightmare Before Christmas too. Although that totally freaked me out as a kid! The Nightmare Before Christmas is one of my all time favorite movies! 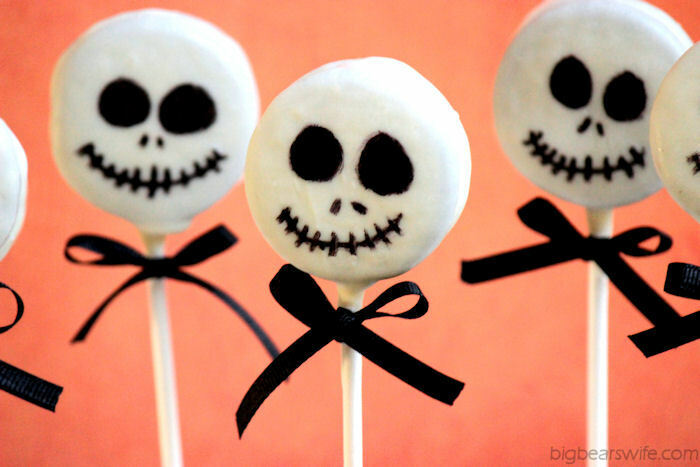 I don’t want to call these pops cute, because Jack Skellington is anything but cute….but they are! Great Halloween idea! Seriously Angie, how cute are these!!! We may have a Nightmare Before Christmas Grooms cake at the wedding 🙂 Figured you would like that! I’ve just realised, as it’s almost Halloween, I;’m officially allowed to watch the Nightmare Before Christmas – and will watch it a lot between now and Christmas! 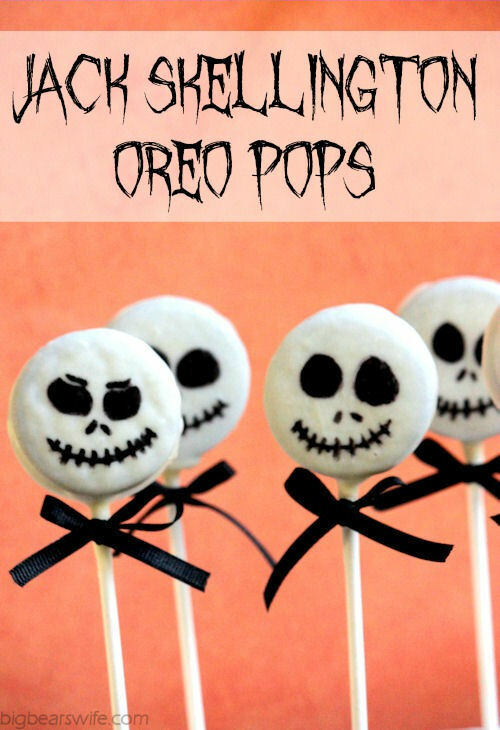 I am with you there 🙂 Your oreo pops look so professional – perfect for a Halloween/Nightmare Before Christmas party! And Jack Skellington is the coolest- I love a Nightmare Before Christmas! Those are brilliant, I looooove Jack and have watched the movie so many times!! Happy Hauntings!!! SO cute! I love that you used Halloween Oreos. Love the orange on the inside. EEEEE! Love that movie and LOOOVE these adorable pops!!!!! 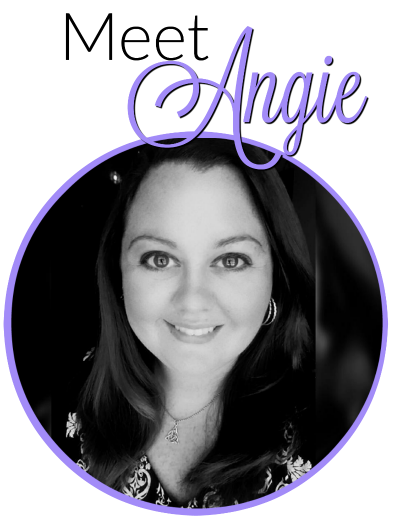 I have never seen the movie but I hope we can still be friends, Angie. 🙂 I do adore your idea of using the Oreos instead of making cake pops. Those can be such a pain. 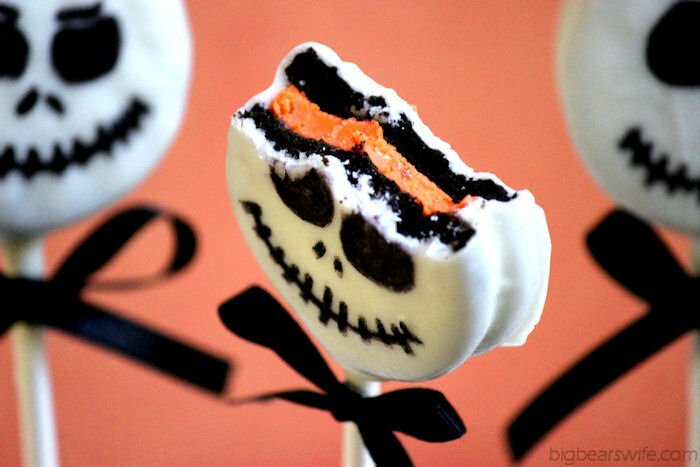 Your Jack Skellington Oreo Pops would be a hit at any party! Angie, these are just the cutest! 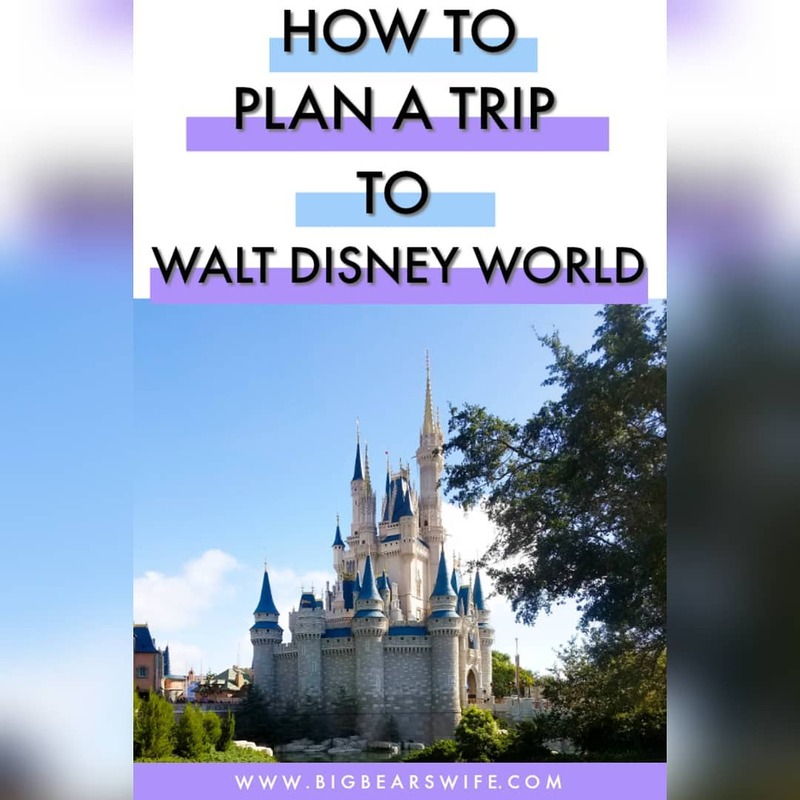 What a perfect way to celebrate your favorite movie! What fun! And they look so cool! I’ve never seen the movie all the way through, but do love the song Jack sings (I had it on a Disney CD, it’s so haunting). I love that you used Halloween Oreo’s instead of just regular ones, they look so much better on the inside! 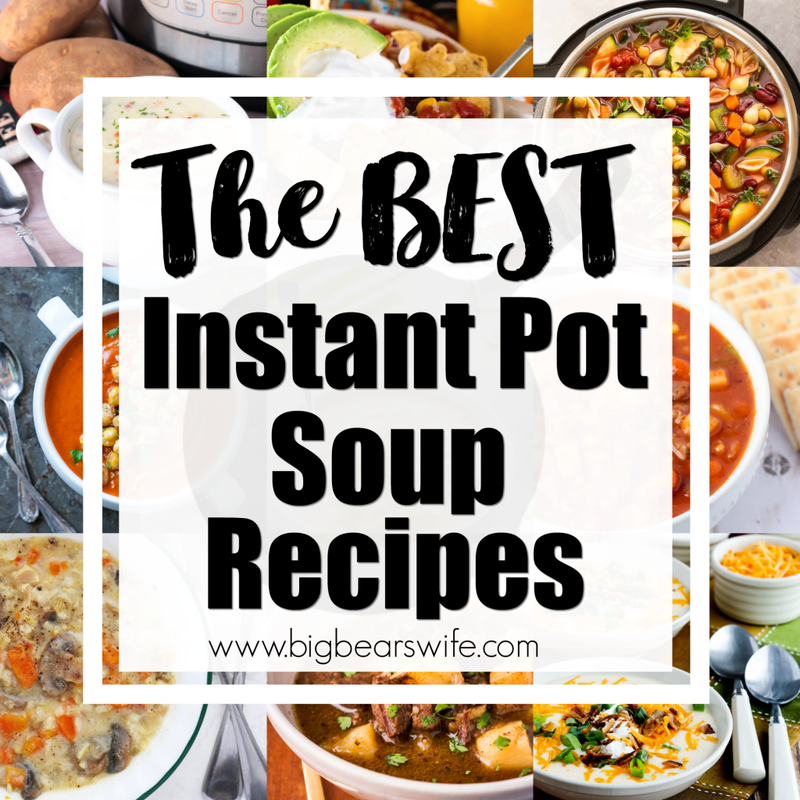 Thanks for sharing this fun, easy recipe on #SundaySupper. So cute! I love the eyebrows on that one! Angie those seriously are just about the cutest Halloween treat I have ever seen!! I’d love to know what edible marker was used because I tried a Wilson Edible Writer and it apparently is not made for chocolate! So disappointed. I purchased a brand new set of the same (black & orange). I waited for the chocolate to harden, and even though I used the paper towel method, the marker is still too dull to and looks more like an inconsistent gray at best. Maybe the chocolate I am using has a higher grease content or something? I’ll try again. Ekk, that’s not good. I wonder if it was just a bad pack of markers? Maybe so. I am now using the edible dye and painting on the faces which is not nearly as solid and clean as the black features in your faces but is working. Thank you for your help and this blog! Nope – not a fluke of a bad package. It’s 2016 and I bought the Wilton markers – I’ve had the very same trouble. I was fortunate to have a liquid black food coloring in my cabinet and used that since I needed these done like yesterday. I wished I had read all the comments before proceeding with the project. Maybe you could update your post to read what markers are working for you now (the ones I see in a comment below). How soon in advance can you make these? How would you store them? When I’ve made them I normally make them a few days in advance. Maybe 2 or 3 days in advance. Then I just put them in an airtight container. Thank you for the tips. I did not have time to order the Americolor pens so I opted to give Wilton a go, but they were terrible! I ended up having to use a black Wilton icing writer tube. They did not look as pretty as yours but it was much better than the Wilton pens! You should be able to find the Americolor pens at Hobby Lobby, Michaels and maybe even walmart. 🙂 I’m so sorry that everyone is having trouble with the wilton makers. They use to be so amazing, so sad to hear that they’re not as good anymore. 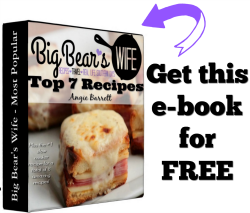 This was the absolute cutest recipe when I saw it, but when I made it, not so much! They turned out like crap and the Candy Melts sucked! 0/10!!!!!! Hi, trying to make these and I bought the white candy melts by mistake. Will the white chocolate melt better you think? It’s incredibly thick and not working out with the melts. I love these! And Jack as much as you do! Pinning for next year and I also just shared this on my FB page (link included of course!) 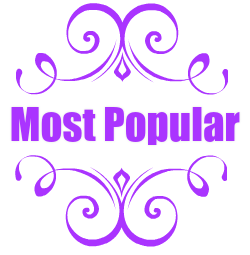 Thanks for a fabulous post!